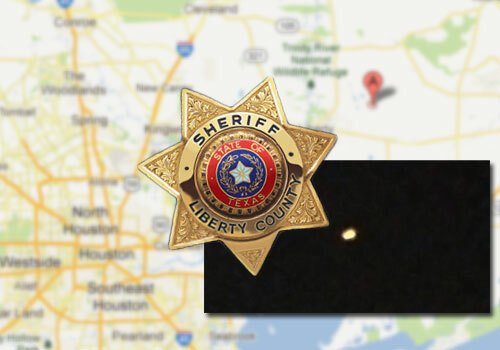 A witness contacted the Liberty County Sheriff’s Department on Saturday, March 23 to report multiple UFOs in the sky above Daisetta, Texas. According to KTRK ABC13 in Houston, the witness described the UFOs as “red fire balls in the sky” to a Sheriff’s Department dispatcher. Deputies responded and observed the UFOs themselves. They report seeing four orange lights in the sky at approximately 3,000 feet in altitude, traveling slowly in a “loose line” spanning approximately ten miles. 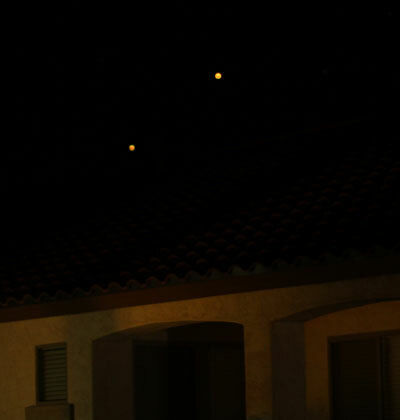 The deputies say that, after observing the lights for a few seconds, “three of the objects disappeared and shortly thereafter, a fourth one disappeared.” But after these four lights disappeared, eight to ten other fireball UFOs appeared in approximately the same location in the sky, and traveled in the same direction as the previous objects. Deputies say that at least ten to twelve other witnesses saw the fireball UFOs. The Sheriff’s Office contacted both the FAA and National Weather Bureau, but neither were able to provide any clues to help identify the strange aerial lights. But according to KSAT, the National UFO Reporting Center (NUFORC) provided deputies with a possible explanation for the lights. NUFORC explained that “similar sightings in Florida had been reported last week and could possibly be what is described as ‘sky lanterns’ that are released during various celebrations.” Deputies seem to doubt this explanation, because they reportedly stated that sky lanterns are not usually released in large numbers. Although this might not “usually” be the case, sky lanterns (or Chinese lanterns as they are also known) are occasionally released in large numbers when launched during a celebration, as mentioned by NUFORC. These paper lanterns function like mini hot air balloons, drifting slowly through the sky for a brief period of time. The lantern appears to disappear when the fuel cell heating the air inside the balloon expires. The deputies were able to ascertain that the wind direction at 3,000 feet on March 23 would have caused a “balloon-type object” to drift in a southwest direction. The fireball UFOs observed that night were traveling in a southwest direction. The fireball UFOs observed over Daisetta, TX do fit the description and behavior of sky lanterns. But an official identification has not been made. According to ABC13, a resident of nearby Raywood, TX came forward claiming responsibility for the fireball UFOs. This individual says the mysterious lights were from approximately fifty to seventy-five sky lanterns released at a wedding reception.